Kültür yoncası (Medicago sativa L.), ıslah çalışmaları sonucunda Medicago sativa tür kompleksinden geliştirilmiştir. Son zamanlarda, yonca bitkisindeki çalışmaların moleküler markörler temelinde DNA polimorfizmlerini belirlemeye ve bu polimorfizmlerle ilişkili olan fenotipler arasında bağlantı kurmaya odaklandığı bilinmektedir. Özellikle genotipler ve fenotipler arasındaki ilişkiler, Bağlantı Analizleri ve İlişki Haritalama çalışmaları şeklinde değerlendirilmektedir. Bilgiler temelinde bu çalışmada; 70 populasyon için 31 SSR markörü kullanılarak Bağlantı Eşitsizliği (Linkage Disequilibrium, LD) analizi de gerçekleştirilmiştir. Bağlantı Eşitsizliği analizi için; 31 markörden 23 tanesinin yonca’nın 8 kromozomu üzerindeki fiziksel mesafeleri belirlenmiştir. 8 kromozom üzerinde 103 lokustan oluşan mesafeler Medicago truncatula genomu temel alınarak saptanmıştır. Değerlendirilen markörler için; bu populasyonlarda önemli (p<0,0001) bir Bağlantı Eşitsizliği (LD) değeri gözlenmemiştir. Cultivated alfalfa (Medicago sativa L.) was derived from Medicago sativa species complex as a result of breeding efforts. New efforts have focused on to determine the DNA polymorphisms based on molecular markers and to link these polymorphisms with related phenotype recently. Especially, the relationships between genotypes and phenotypes are evaluated as Linkage Analysis and Association Mapping Studies. On the basis of information, in this study, Linkage Disequilibrium (LD) analysis was also performed using 31 SSR markers for the 70 populations. For the LD analysis, 23 of the 31 markers identified the physical distances on the 8 chromosomes of the alfalfa. Distances of 103 loci on 8 chromosomes were determined based on Medicago truncatula genome. A significant (p<0,0001) LD value was not observed in these populations for the evaluated markers. Alm V, Fang C, Busso CS, Devos KM, Vollan K, Grieg Z, Rognli OA 2003. A linkage map of meadow fescue (Festuca pratensis Huds.) and comparative mapping with other Poaceae species. Theor. Appl. Genet. 108:25–40. Branca A, Paape TD, Zhou P, Briskine R, Farmer AD, Mudge J, Bharti AK, Woodward JE, May GD, Gentzbittel L, Ben C, Denny R, Sadowsky MJ, Ronfort J, Bataillon T, Young ND, Tif- fin P 2011. Whole-genome nucleotide diversity, recombination and linkage disequilibrium in the model legume Medicago trun-catula. Proc Natl Acad Sci USA 108:E864–E870. Brummer EC 1999. Capturing heterosis in forage crop cultivar development. Crop Sci 39: 943–954. Caldwell KS, Russell J, Langridge P, Powell W 2006. Extreme population-dependent linkage disequilibrium detected in an inbreeding plant species, Hordeum vulgare. Genetics 172:557–567. Dabney AR, Storey JD 2007. A new approach to intensity-dependent normalization of two-channel microarrays. Biostatistics 8: 128-139. Doyle JJ, Doyle JL 1990. Isolation of plant DNA from fresh tissue. Focus 12:13–15. Flint-Garcia SA, Thornsberry JM, Buckler ES 2003. Structure of linkage disequilibrium in plants. Annu. Rev. Plant Biol. 54:357–374. Herrmann D, Barre P, Santoni S, Julier B 2010. Association of a CONSTANS-LIKE gene to flowering and height in autotetraploit alfalfa. Theor Appl Genet., 121: 865-876. Hyten DL, Choi IY, Song Q, Shoemaker RC, Nelson RL, Costa JM, Specht JE, Cregan PB 2007. Highly variable patterns of linkage disequilibrium in multiple soybean populations. Genetics 175:1937–1944. İlhan D, Li X, Brummer EC, Sakiroglu M 2016. Genetic Diversity and Population Structure of Tetraploid Accessions of the Medicago sativa – falcata Complex. Crop Science 56: 1-11. Julier B, Flajoulot S, Barre P, Cardinet G, Santoni S, Huguet T, Huyghe C 2003. Construction of two genetic linkage maps in cultivated tetraploit alfalfa (Medicago sativa) using microsatellite and AFLP markers. BMC Plant Biol., 3:9. Kim S, Plagnol V, Hu TT, Toomajian C, Clark RM, Ossowski S, Ecker JR, Weigel D, Nordborg M 2007. Recombination and linkage disequilibrium in Arabidopsis thaliana. Nat Genet 39:1151–1155. Kir B, Soya H 2008. The investigation on some yield and quality characteristics of some pasture type alfalfa cultivars. Ege Univ. 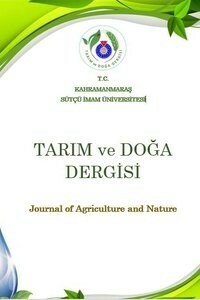 Journal of Agriculture Faculty, 45 (1): 11-19. (in Turkish). Kraakman ATW, Niks RE, Van den Berg PMMM, Stam P, Van Eeu- wijk FA 2004. Linkage disequilibrium mapping of yield and yield stability in modern spring barley cultivars. Genetics 168:435–446. Lande R, Thompson R 1990. Efficiency of marker-assisted selection in improvement of quantitative traits. Genetics, 124: 743-756. Lesins KA Lesins I 1979. Genus Medicago (Leguminosae), A taxogenetic study. Dr. W. Junk Publishers, The Hague. Li X, Wei Y, Moore KJ, Michaud R, Viands DR et al. 2011b. Association mapping of biomass yield and stem composition in a tetraploid alfalfa breeding population. Plant Genome 4: 24–35. Li X, Han Y, Wei Y, Acharya A, Farmer AD, Ho J, Monteros MJ, Brummer EC 2014. Development of an alfalfa SNP array and its use to evaluate patterns of population structure and linkage disequilibrium. PLoS One 9:e84329. Liu A, Burke JM 2006. Patterns of nucleotide diversity in wild and cultivated sunflower. Genetics 173:321–330. Maccaferri M, Sanguineti MC, Noli E, Tuberosa R 2005. Population structure and long-range linkage disequilibrium in a durum wheat elite collection. Mol Breed 15:271–290. Mather KA, Caicedo AL, Polato NR, Olsen KM, McCouch S, Purugganan MD 2007. The extent of linkage disequilibrium in rice (Oryza sativa L.). Genetics 177:2223–2232. Morrell PL, Toleno DM, Lundy KE, Clegg MT 2005. Low levels of linkage disequilibrium in wild barley (Hordeum vulgare ssp. spon- taneum) despite high rates of self-fertilization. Proc. Natl. Acad. Sci. USA 102:2442–2447. Nordborg M 2000. Linkage disequilibrium, gene trees and selfing: An ancestral recombination graph with partial self-fertilization. Genetics 154:923–929. Nordborg M, Borevitz JO, Bergelson J, Berry CC, Chory J, Hagen- blad J, Kreitman M, Maloof JN, Noyes T, Oefner PJ, Stahl EA, Weigel D 2002. The extent of linkage disequilibrium in Arabi- dopsis thaliana. Nat Genet 30:190–193. Raboin L-M, Pauquet J, Butterfield M, D’Hont A, Glaszmann J-C 2008. Analysis of genome-wide linkage disequilibrium in the highly polyploid sugarcane. Theor Appl Genet 116:701–714. Rafalski A, Morgante M 2004. Corn and Humans: recombination and linkage disequilibrium in two genomes of similar size. Trends Genet., 20:103-111. Remington DL, Thornsberry JM, Matsuoka Y, Wilson LM, Whitt SR, Doebley J, Kresovich S, Goodman MM, Buckler ES 2001. Structure of linkage disequilibrium and phenotypic associations in the maize genome. Proc Natl Acad Sci USA 98:11479–11484. Robins JG, Luth D, Campbell IA, Bauchan GR, He CL et al. 2007. Genetic mapping of biomass production in tetraploid alfalfa. Crop Sci 47: 1–10. Sledge MK, Ray IM, Jiang G 2005. An expressed sequence tag SSR map of tetraploid alfalfa (Medicago sativa L.) Theor Appl Genet, 111: 980-992. Stuber CW, Polacco M, Senior ML 1999. Synergy of empirical breeding, marker-assisted selection, and genomicsto increase crop yield potential. Crop Sci., 39: 1571-1583. Sakiroglu M, İlhan D, Kaya MM, Demirozogul O, Ulucay O, Eren B 2011. In the Light of The Current State of The Molecular Complex of (M. sativa L.). Kafkas Univ. Journal of Science Instit. 4(1):32-42. (in Turkish). Sakiroglu M, Sherman-Broyles S, Story A, Moore KJ, Doyle JJ and Brummer EC 2012. Patterns of linkage disequilibrium and association mapping in diploid alfalfa (M. sativa L.). Theoretical and Applied Genetics, 125(3):577-590. Sakiroglu M, Brummer EC 2012. Presence of phylogeographic structure among wild diploid alfalfa populations (Medicago sativa subsp. microcarpa Urb.) with evidence of the center of origin. Genet Resour Crop Evo., 60:23-31. Tenaillon MI, Sawkins MC, Long AD, Gaut RL, Doebley JF, Gaut BS 2001. Patterns of DNA sequence polymorphism along chromo- some 1 of maize (Zea mays ssp. mays L.). Proc Natl Acad Sci USA 98:9161–9166. Van Inghelandt D, Reif JC, Dhillon BS, Flament P, Melchinger AE 2011. Extent and genome-wide distribution of linkage disequilibrium in commercial maize germplasm. Theor Appl Genet 123:11–20. Yan J, Shah T, Warburton ML, Buckler ES, McMullen MD, Crouch J 2009. Genetic characterization and linkage disequilibrium estimation of a global maize collection using SNP markers. PloS One 4:e8451. Yu J, Pressoir G, Briggs WH, Vroh BI, Yamasaki M et al. 2006. A unified mixed-model method for association mapping that accounts for multiple levels of relatedness. Nat Genet 38: 203–208.